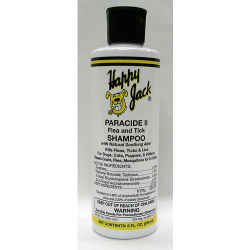 PARACIDE II HAPPY JACK 8 oz. This formula contains Pyrethrins, the most effective water soluble insecticide. Paracide may be used in conjunction with other flea and tick control measures. It's gentle, non-alkaline, hypoallergenic, and completely biodegradable. Extremely high flea mortality. Paracide Flea & Tick Shampoo kills fleas and ticks on dogs, cats, puppies, and kittens, as well as ferrets and horses (12 weeks of age or older).